Your drive shaft is just one of many components that are vital to the proper functioning of your automobile. Responsible for converting power from the gearbox to the wheels, a healthy drive shaft is a necessity. Cars make noise. It’s just what they do. However, not all noises that come from cars are harmless. Some noises are indicative of serious problems with the components within your car. In a general sense, the only noises your car should be making are engine noises. If other noises are present on a continuous basis, something is probably wrong. One type of noise that is often present with a deteriorated drive shaft is squeaking. As they pertain to drive shafts, squeaking noises typically appear with broken down U-joints. 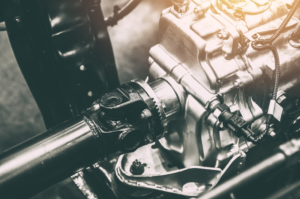 If you hear a consistent squeaking noise coming from your vehicle, you need to have it checked out by a professional Hillside transmission mechanic as soon as possible. He or she will identify the source of the noise, and make repairs necessary to prolong your vehicle’s lifespan. Another sign that your car’s U-joints are broken down and deteriorated is if you hear loud thudding noises coming from your vehicle. These noises will typically occur when you put your vehicle into gear; either drive or reverse. If you happen to hear these thudding or clunking noises, it’s vital that you have your automobile inspected fairly quickly. Allowing noises such as these to continue unchecked can result in permanent problems for your vehicle. Unless you have a truly high-end vehicle, it’s bound to vibrate when idle. Small amounts of vibration are not a cause for concern. However, there is a point at which car vibration becomes a problem. If you find it impossible to ignore the amount of vibration that is coming from your car, it is likely a problem has arisen. In all likelihood, it’s a problem with your drive shaft. It’s never wise to continue driving in an excessively shaky vehicle. It’s recommended that you have it checked out by a professional mechanic as soon as you can. Anything from a small to large repair could be needed. Turning a car should be simple. You should never, under any circumstances, have to yank your steering wheel as hard as you can in order to round corners. If you do, your drive shaft undoubtedly requires a repair of some sort. After all, the drive shaft is the component of the car that is used to transfer power to the wheels. It stands to reason that its breakdown and deterioration would lead to a vehicle that can’t turn properly. Chances are, if your car isn’t turning properly, you’ll want to get it into a Hillside transmission repair mechanic as soon as possible. However, if you’re continuing to drive despite its flaws, it would be wise to stop immediately. Driving a car that is damaged in this manner can spell out disaster in the long run. Do You Require Drive Shaft Repair in Hillside, Illinois? Is your vehicle demonstrating any of the problems reviewed above? If so, it’s time for a repair. Looking for professional drive shaft repair services in Hillside, Illinois? King Transmission is the company to call. We’ve been in business since 1954, and have repaired drive shafts on thousands of cars. Regardless of the make or model of your vehicle, we can, and will accommodate you.